Raymi nodded at Neruth as he walked off with the fish. She narrowed her eyes and flapped her wings, trying to get herself up into the air. She was relatively light and she soon was up in the sky. Her wings gave away, but she managed spread her wings enough so she would glide instead of completely falling to the ground. She let out a sigh as she landed, frustrated with herself. She sighed and started to walk towards the cave. The Hellhorse hatchling eventually became bored once more and returned to the cave. She looked around at the scattered eggs and shook her head. We need room for beds. I think we should move these eggs to the very back in the soft grass, she thought. "Help me move the eggs!" she called to the others as she began gently sliding a red egg through the sand. Fyria worked slowly to avoid damaging the eggs as she neatly arranged the eggs in the grassiest area. She put all of the tiny eggs together, and sorted the rest by breed as well. She was strong for a hatching, and could move even the heaviest eggs without too much trouble. The egg-nest would allow room for hatchling nests toward the front of the cave. Levania felt herself - or whatever what thing she was in - being moved. She started picking the egg away with her teeth, trying to find a way out. She let out her frustration in a kick that sent her tumbling out. She looked around and saw a purple hatchling pushing all of the eggs. "What are you doing that for?" She croaked as if she hadn't spoken in ages. As Fyria started moving the eggs to the back of the cave Iria and Aria walked over. "Can we help?" they asked at the same time as they reached the hellhorse hatchling, "Which ones should we move?" They asked both looking around. Raymi walked into the cave, looking at Fyria moving the eggs. She walked towards an egg that looked like hers and started pushing it towards the pile that Fyria made. As she let it roll the last few inches she looked at Fyria,"Why are we moving the eggs?" she asked. She started pushing another over, putting it with an egg that looked like it. There are a lot of eggs... she thought as she looked around. Lifaen stood and watched everything, from when the dragons started eating and then to them making beds for the eggs. Lifaen stood up and padded up to a Hellhorse. "Hi, my names Lifaen what's yours? What are you doing? Hey is there anyway I can help you?" As the other hatchlings started moving eggs Iria and Aira looked at each other and then shrugged. Moving over to a gray egg they started to move it to the grassier area, These are really heavy Iria thought I know! Aria thought back. Suddenly they realized that they could think to each other and fell over laughing. We're freaks! they thought at the same time leading to another bout of uncontrollable laughter. As they calmed down Aria suddenly realized that there discovery had probably looked really strange. Putting her head downAria started pushing again and with Iria's help it was soon in place. Levania stopped waiting for an answer and walked past a two-headed dragon. What freaks. She thought to herself. She walked over to a green hatchling with blue feet. "Hi, I'm Levania. What are you guys doing?" She asked. "Hi Kite, hi Lifaen, I'm Fyria. I'm moving all the eggs so we can all have beds. They took up almost the whole cave before," the Hellhorse replied as she nudged a rough grey egg into the grass. "I figured that our nests can be made from grass, but also the furs of our kills," she added motioning toward the skins and bones of the squirrel. "Should probably clean 'em first…"
With most of the eggs tucked in the nest, Fyria retrieved the furs and submerged them in the pool of water. Once clean, she put them out on a rock to dry. They were very soft, and she was confident they would make good bedding. Next, the hachling began cleaning out her scattered eggshells. She buried them outside, but held onto a shard to put keep in her nest. The Hellhorse then busied herself in collecting grasses and other soft materials for her bed. As they finished with the egg Iria watched as Fyria started making a nest. "Hey Aria we should make a nest." Iria suggested, "Alright." Aria agreed walking over to the entrance of the cave. As they stepped outside Aria and Iria stopped abruptly. As two pairs of eyes, one a deep emerald and the other a piercing blue, flickered over the bright world outside. Wow they thought at the same time. Coming back to their senses Iria and Aria quickly started picking grasses and leaves to build a nest. Raymi nodded at the hellhorse, though she was quiet and walked off towards the grass. She didn't have any arms like the other hatchlings. Her eyes narrowed and then she bent her head, doing her best to gently pick grass from the ground. As soon as she had picked a bunch she set it down and began picking more. Sounds were heard coming from somewhere else, somewhere she could not pinpoint. They appeared to be surrounding her, coming from every corner she could not identify. There was a faint orange glow piercing through the walls she had claimed as home for so long...what made it glow as such? She wanted to know. Rocking herself, she managed to sway the egg to far on one side and found it smashing against a rock where she slid out of the gooey mess that had once been her home. She squinted as the orange glow irritated her eyes; what was this place? Raising her head, she made a small mewling sound at the painful rays of the sun, wanting them to stop. Neruth watched quietly as the hatchlings shifted the eggs around, then left to find something else to hunt, preferably something with a soft pelt. Wandering through the grass, Neruth caught sight of a rabbit. Neruth crouched down, and was about to kill it when a telltale rustle alerted the rabbit to his presence. It bolted off, and Neruth looked for something else. Seeing another rabbit, Neruth repeated his tactic, more careful this time not to give away his presence. Killing it swiftly, Neruth attempted to skin it, and got the fur off in one piece, more or less. Neruth took the meat back to the cave, and placed the pelt in a dark, closed off corner of the cave. Looking up, he could see that there was a small tunnel in the cave's roof above him that let in the starlight. Even better, Neruth thought. Everyone was going their own way to make their bedding now, but Kite wanted to continue making beds for the eggs. He didn't really care about a bed for himself right now, and he really wanted to make others comfortable. So while other hatchlings set about going their way to get material for their beds, he moved eggs towards grassy clumps near cave walls, all together for company he was sure they'd want. He was happy with his work, and got slightly better with it as he went. Kite was determined not to stop until the eggs were more 'comfortable', even though it was tiring. When her eyes had finally adjusted, Estra found a several others going about their business. She watched several of them come and go somewhere she could not see. What else was out there? Attempting to stand, she found her legs to be rather wabbly and decided to sit in an upright position instead. She turned to see a small, neon-green hatchling scurrying about as he fussed with grass and other materials. "H-hullo," she stammered, feeling it was a proper way of getting one's attention. Raymi looked at the small pile of grass she had made and picked it up, starting to walk towards the cave. She found a nice, bright spot near the side of the cave. She dropped the grass, making a slight indent. Looking around, she caught sight of a new hatchling sitting on the ground. She started walking towards her, her wings flapping at random times,"Hello." she greeted as she got closer. By the time Fyria had collected enough grass, leaves, feathers, and fur to build her nest, the sun was almost touch the horizon. A dim light now filled the cave as she worked, constructing her bed in a crevice-like indent in the cave's wall. It was large enough for a fully grown dragon, which was intended. The Hellhorse was not keen on making another nest once she grew up. Lastly, she placed the eggshell shard in the nest before going back outside. The sky was stained a blood red as the sun sank slowly in the west. The hatchling stood by a stream and watched the beautiful skyline. Crickets began their symphony of chirping, and fireflies blinked into view. The scene was peaceful and quiet but, not to Fyria's knowledge, a creature lurked in the undergrowth, waiting to strike. It was just as she was returning to the cave when it revealed itself. A coyote, growling and snarling stalked forward into sight towards the Hellhorse. It was just as big as her, and much more dangerous. Razor-like fangs gleamed in the moonlight, and yellow eyes gleamed with hunger. Knowing that the others could get hurt if she ran, Fyria stood her ground and let out a low rumble. The beast seemed to cackle at her 'threat' before it lunged. The hatchling darted out of the way, and the coyote skidded to a halt, sending dust flying into the air. It snarled in frustration and went in for a second attack. Ready for it, the Hellhorse whipped around and gave the animal a sharp kick to the head. However, it recovered quickly and sunk it's teeth into Fyria's hind leg. She fell to the ground with a cry of pain, and the coyote made to hesitation in pinning her by the neck. The eyes gleamed: victory. Something, however, stirred in Fyria's chest and blue flames erupted from her maw, burning the creature's face and front. Howling in pain, it turned and fled with it's tail between it's legs. Fyria shakily got to her hooves and watched the thing run. Though pleased with her fight, she shook from head to tail. Her right hind leg was sticky with her own blood, and the hatchling felt a bit faint. Not like this... she thought desperately. Kite turned at the greeting of the green hatchling with a red collar, taking his paws off the egg momentarily to divert full attention to the social situation. "Hello," he replied as Raymi approached. "I'm Kite," he said with a smile, "And she's Raymi. Who are you?" Neruth wandered along, looking for something else to kill before it was night. He had finished setting up his nest in the back, and had stored food near it as well. He would be able to live off of the storage for a few days in the event that he was injured badly and could not hunt. Looking around, Neruth saw a coyote running away, its face badly burnt. Walking back to the cave, Neruth saw a Hellhorse hatchling that was wounded. I presume that you fought with the coyote? Neruth asked, quizzically. Also, I believe that I have forgotten your name. Could you remind me what it was? I am Neruth. 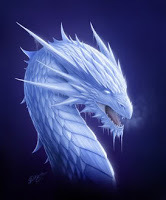 "Estra," she replied with a smile, glad to see these dragons were rather friendly. She sat there, glancing between the two as she noticed the egg Kite had been fussing with earlier. "What are y-you doing?" she asked, curious to know what this world had to offer. Lifaen returned to the cave. When he was nearing the entrance he saw Fyria laying on her side with blood splattered all over her. "Hi Fyria. I caught a deer and was wondering what we do with the pelts. Are you ok? How did you get injured?" Lifaen looked at the dragon next to him. "Hello! My Name's Lifaen. Do you know what happened to Fyria?" Neruth looked towards the new dragon, and replied, hello, Lifaen. I am Neruth. I do not know exactly what happened, but I believe that Fyria here was assaulted by a coyote. I am merely guessing this because her wounds imply a fight, and I saw a coyote with a burnt face running from this location. All else is speculation. Neruth was being deliberately obscure and obtuse in order to halt the conversation quickly. He hoped to get back to his nest, and prepare for the next day.